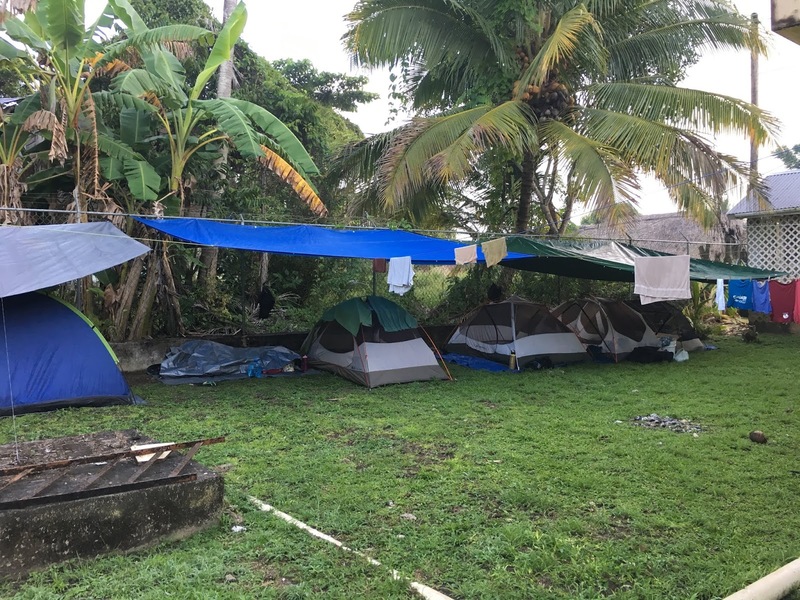 MOVE, (Missionary Outreach Volunteer Evangelism) is a volunteer-staffed, faith-based missionary training school located near Orange Walk, Belize. MOVE exists to inspire, equip and mobilize missionaries to serve in difficult places around the world. The stories I share on this site are experiences I've had while working with MOVE students and in evangelism with the local churches. After a typically full church service we made five visits in the afternoon including two neat contacts with Evangical folks in Chan Pine Ridge. One lady named Angela is the wife of an evangelical pastor in another village and she hitchhikes every weekend to come take care of her 90 year old mother. Last week the student who was with me gave her a tract on the Sabbath. Today she told us that she read it but started to give her reasons for keeping Sunday. God helped me keep the conversation from degenerating into an argument, and yet he gave me words to say with joy and conviction, including a selection of pertinent Bible verses. She seemed touched and open to hearing more. After visiting we had singing bands at the hospital and prayed and sang to the nurses on duty as well as 7 or 8 different patients. 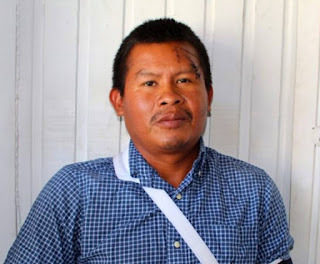 Two of the latter were adolescents recovering from gunshot wounds from a shootout with police when they tried to rob the money changers at the Belizean side of the Mexican border. An officer stood guard as we sang and prayed with them. After the hospital we stopped to see a church member who’s son has a bad case of food poisoning. He has not eaten for five days and is very weak. We were able to help them so they can get the proper medicine since the charcoal he was taking, though helping was not cutting it. On our way home from there we came across a grisly hit and run accident. An elderly cyclist left dead like common roadkill. It was a grisly sight. The next day we found out that the victim was Marvin's father. Marvin is one of several backslidden Adventists who live in CPR. We will visit him and his family tomorrow Lord willing. Anyway, this time is spare on the description, but it’s late and I’m ready for bed. Thanks for your prayers! We need them ever so much. You are in ours as well. Calling Prayer Warriors: Turn the battle to the gates! This last week a simple question to my local pastor about global youth day turned into an unexpected opportunity for me to share a plan for involving all the Adventist youth in Belize in continual, ongoing evangelism during the next year. (See attached document if you desire). Please pray for the awakening of our church here and all around the world, that to finish the Father’s work may become even more important to us than our daily food, just as it was for Jesus! (John 4:34). 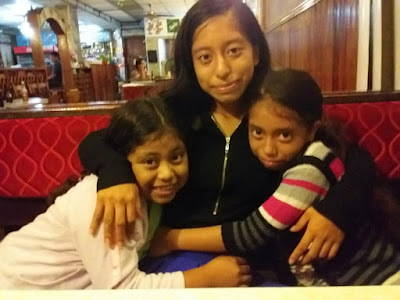 We have a family of travelers staying with us since last Sunday when they met one of our missionary volunteers in a divine appointment in Carmelita village. Igor is from Latvia and his wife Tamar is from Argentina but they are both of Jewish decent and grew up speaking Hebrew. They live in Israel where they met while studying in the university. Now they are driving an RV from the U.S. to Argentina with their four adorable children ages 4-10. I sense that they are seekers for truth. They are full of questions, but they are skeptical of God and religion in general. They have been participating in many of our activities though, and tomorrow I will invite them to join us for church and singing bands at the hospital in the afternoon. Please pray for our witness. 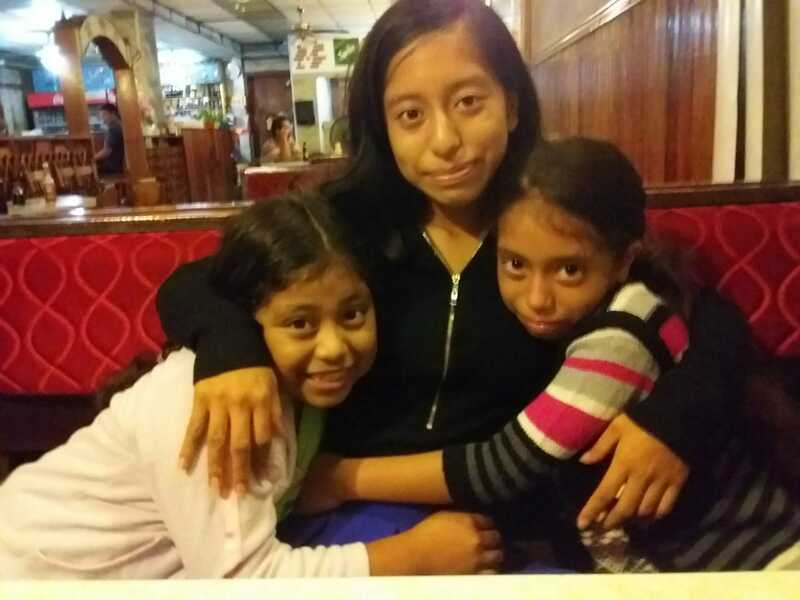 Alla and her daughters Elizabeth and Eva lost their husband and father Christopher when he fell down a one-hundred-foot precipice in the mountains of Guayana about two weeks ago. Captain Lincoln Gomez, a friend and fellow missionary of ours from our time in Bolivia now working in his native Guayana was flying out Christopher’s body when his plane ran out of fuel just before reaching Georgetown and he was forced to make an emergency landing in the jungle. God was merciful, and he and the police officer flying with him both survived the crash, but Lincoln is facing a long and painful recovery and staggering medical bills. Right now he is being monitored for numbness. The airplane motor and perhaps some instruments will be recoverable as I understand, but the plane won’t fly again. 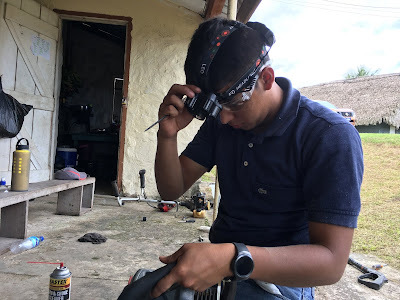 If you wish to help Lincoln and his family at this time you may do so through GMI, making your donation to “Guayana Indigenous Aviation.” You can also send money through Paypal. Captain Lincoln Gomez in recovery. Finally, please pray for another missionary friend of ours who is very shook up over the sudden loss of his brother to suicide. Pray for us too, and don’t stop! We sure need it! We arrived from evangelism and visitation late Sunday night, and as we cut across the grass toward home I caught a whiff of something raunchy. “Something stinks! What is that?” I wondered out loud. “Maybe it is the sugar factory” Lyli ventured. As we passed the tool shed near the entrance of our driveway, the stench worsened. “It smells like something burnt!” I exclaimed. Sure enough, during our rush of activities before getting out the door we had forgotten to turn off the burner. The pot on the stovetop was black as tar, and even the trim on the neighboring countertop matched and was too hot to touch. 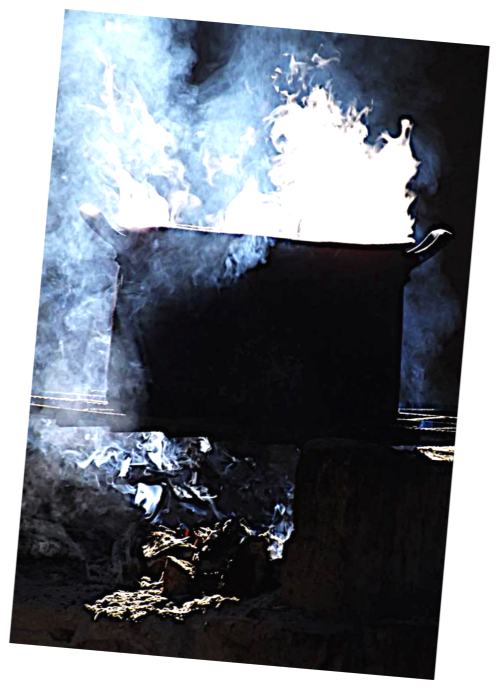 Inside the kettle was a smoldering mass of roasted lentil crisp, as black and porous as volcanic rock. I carried the whole molten lump out and away to the garbage pit. If only the smell were so easy to take away! Caustic smoke seemed to saturate every molecule of matter in every article in every nook and cranny of our abode. All things fabric had wicked up enough odor to out-stink an apartment of chain-smokers. Worst of all, not even a puff of a breeze did blow, and the smoke hung over and around the house like a pall. We opened all the windows and doors, turned on the fans, boiled vinegar, set out backing soda and slices of onion, took down the curtains, and started scrubbing doors, walls and windows, but it was already late, and we finally fell into bed exhausted, only to have our noses sting and our scratchy throats gel over with mucous, and good sleep flee as from a burning. “The smoke of their torment ascendeth up for ever and ever, and they have no rest day or night” Revelation 14:11 thundered through my head. If nothing else, this experience definitely reaffirmsmy decision to never worship the beast or his image!I thought wryly. I’d rather keep the commandments and have the faith of Jesus by God’s grace! In which case, you had better not complain, had you,another internal voice seemed to chime. For the faith of Jesus would joyfully trust that this trial has been allowed for your growth and benefit. Besides, this trial is merely smoky. You’ve seen nothing yet of the fiery trial that is to try you! I had to concede on that one, and praised the Lord that our house hadn’t burned down. Otherwise our pot of lentils would have been almost as costly as Esau’s! In the morning we went back to cleaning. In between classes and other responsibilities, we washed clothes, scrubbed walls, and put the mattress and furniture out to air, but the house still reeked like scalded lentils all week long! We pitched our tent in our front yard for two nights. Sleeping on the ground was still much more restful than breathing smoke all night. So, whatever you do, don’t boil things when you’re in a rush to leave the house! Also, when you smell something terrible, be careful what you say: you just might be the culprit! You might be trying to do great things for God, but don’t neglect the little things. The damage of one moment’s forgetfulness and negligence may take many days of hard work to undo! Lyli and I are back in Belize after a month stateside where we saw God’s hand over us again in powerful and personal ways. Lyli endured a series of trials in which she faced three of her greatest fears: flying, public speaking, and oral exams. God gave her grace to overcome in every occasion. She survived multiple flights in bumpy winter weather, shared her testimony in two different churches, and passed her civics and language exam and is now a U.S. citizen! After almost two years of processing we are thrilled to have that taken care of! Thank you all who lifted her up in prayer. God also provided for our needs above and beyond what we expected through a number of kind family friends who shared everything from their car to medical exams and lab work. This week has been a busy round of staff, and starting today, student orientation activities. We have also taken time to pray together and have been inspired to monitor our spiritual orientation and constantly reset tracking to True North. We cannot afford to be guided by our own multi-polar thoughts. That is not a good way to live (Isaiah 65:2). We need to stop listening to ourselves so much and start back-talking that tyrant called Self with the Word of God. Did you know that talking Scripture to yourself is a sign of the Spirit-filled life? The apostle says “…be filled with the Spirit; speaking to yourselves in psalms and hymns and spiritual songs, singing and making melody in your hearts to the Lord” (Eph 5:18-19). So when self takes the helm of our minds, we must commit auto-mutiny. God has given us the power to decide what we will think! Let us surrender those selfish thoughts of anger, bitterness, pride, fear, lust, complacency or whatever it is that is rotting out our soul, and let the abundant life of Jesus flow through us in ever-richer currents! 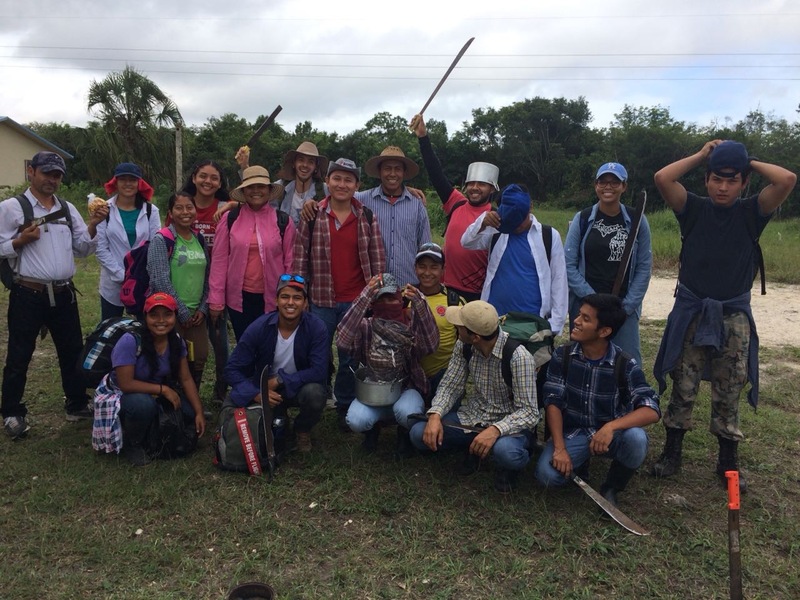 Most of MOVE’s 11thgroup of missionaries in training has arrived now, this time, from Mexico, the U.S., Colombia, Venezuela, Spain, Costa Rica, and right here in Belize. For worship the last couple days they have been telling how God has worked in their lives and how He brought them here. Amazing stories. I’m recording them this time, and Lord willing I will get some of them sent to you soon. Our theme this year is “Move in the Light,” which has been food for deep study and thought. (Enough, in fact, for several sermons, but I summarized some of the highlights for you in a poem which you can find below.) We feel a deep urgency both personally and as a school to make every moment count for eternity. As the moral darkness of the world around us deepens daily, we need serious upgrades in current wattage, both intensity and volume. For that, the cables of our faith need to thicken. Everything about moving in the light speaks growth. I like how Proverbs puts it: “But the path of the just is as the shining light that shines more and more unto the perfect day” (4:18). We don't know how much longer we will have to work with the ease and freedom we enjoy right now. Pray for us, that we will be more intentional, more efficient, more courageous, more Spirit Filled, and that we will in His strength be strong. How fast might it germinate? it yet standeth unconsumed,[x]never to expire! Oh, God Almighty mine, please sow such seed in me forever! “Nothing we can do” but God can do Anything! “Daniel… accident!” were the only two words I understood from the choked-up voice of sister Mirtha when Lyli answered her call on speaker phone early Monday morning. Oh Lord, I sure hope he’s not gone. I thought, fearing the worst as Lyli stepped out of the house to get better reception. “Daniel is in custody at the police station in Orange Walk. He hit a cyclist this morning on his way home to pick up Mirtha and the girls for school.” Lyli informed when she came back inside. “What! Oh no! Was the cyclist killed? Is brother Daniel in jail? Does Mirtha need us to take the girls? Does she need a ride to the police station?” my questions tumbled out. Soon we were bouncing toward town over the potholes accompanied by clouds of dust. When we parked across the street from the precinct, I spotted brother Daniel’s Suzuki Grand Vitara. 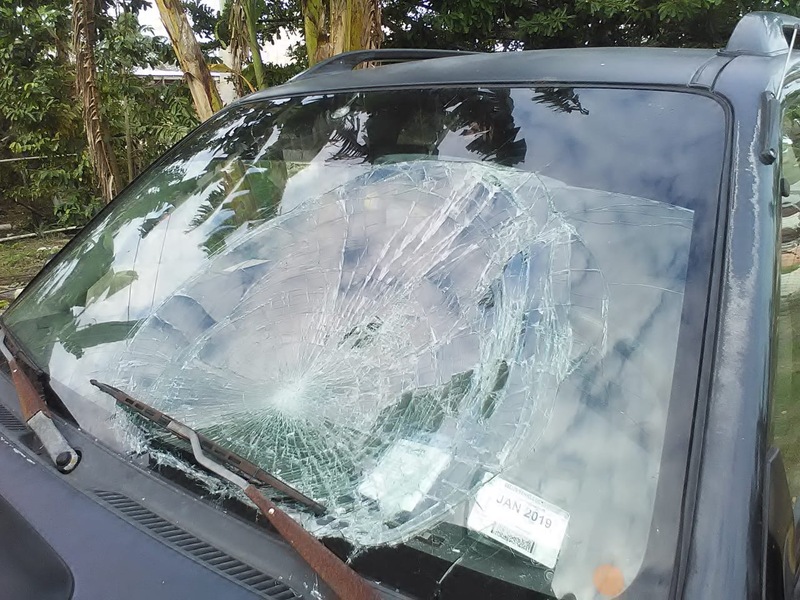 The windshield on the driver’s side was mashed into a sunken bowl of broken glass. White fracture lines extended like a spider’s web from the center of impact which was about the size of a human head. “The bike must have been knocked out from under the rider and he ended up on the hood. By the looks of it his head hit the windshield, and if he is like 98% of cyclists around here, he wasn’t wearing a helmet!” I shuddered as I reconstructed the scene in my imagination. We found the distraught sister Mirtha waiting outside the station doors with her brother-in-law. We learned that Daniel might be kept in custody up to 48 hours, and that it would depend on the cyclist’s condition as well as the results of their inspection of the vehicle whether he would face prosecution. “He has in his favor that he stayed at the scene and tried to help the victim” one official told us. “Has anyone from your family gone to see the cyclist yet? I recommend that you do” the official continued. Daniel’s brother and sister decided to go right away. I offered to drive them. At the hospital we spoke to the cyclist’s son. His father, 70-year-old Rafael, was in the emergency room in a coma. The family needed to transfer him to the hospital in Belize City, but at the moment there was no ambulance driver available. There wasn’t much we could do, but I asked the family if I could pray with them, and they agreed. But what to say? I prayed God would guide my words. Jesús hung his head as we continued to walk toward the truck. “I’ve been really bad,” he confessed. “Just the other day I was telling my wife I want to change, I don’t want to keep on like this. I should go to jail, not Dan! Dan doesn’t deserve this! He is a good guy, always helping people, always strong in his faith. I saw him before he went into the station, he was so calm.” Jesús was near tears. I suddenly remembered the one other conversation I had had with Jesús months ago at a potluck, one of maybe two times he has come to our church over the last two years. He had told me a long bitter story of slights and wrongs he had suffered from pastor’s and church members. I felt impressed to say something else. While I was speaking to Jesús, Daniel was released by the police. “How did the accident happen?” everyone asked him. As soon as Daniel was released, he wanted to go the hospital. Some of us weren’t so sure it was the best idea, but I could see that brother Dan felt terrible about the accident and felt he had to do this. At the hospital, the family was suspicious at first, but eventually accepted his help, just in time to transfer Mr. Rafael to the hospital in Belize City. After several days of care, Mr. Rafael remained in a coma. “There’s nothing more we can do” the doctors admitted. Meanwhile, the whole church came together in earnest prayer on behalf of Rafael and his family as well as brother Daniel. I prayed specifically that God would send an Adventist brother nearby to visit and pray with Rafael and his family, and that God would raise him up in such a way that it would be clear that it was God’s work, so He would receive all the honor and glory. On Friday the seventh, brother Daniel sent us the message. Later I learned that God had even answered my prayer that someone would visit the family at the hospital in Belize City. I had imagined that some brother living in Belize City would visit the hospital, but it was our very own members, the Bochub family who were passing through and stopped to visit and pray with the family right around the time that Mr. Rafael awoke from his coma. To God be the glory! P.S. Please pray that the insurance company will respond soon and cover the medical bills for Mr. Rafael. Yesterday Mr. Rafael told Daniel that God kept him alive for a reason. Pray that he and his family will soon discover what the reason is. Daniel plans to visit him again with some of the church brethren and have a worship service to praise God for his goodness and mercy. Pray that this contact will be for the eternal salvation of this precious family. 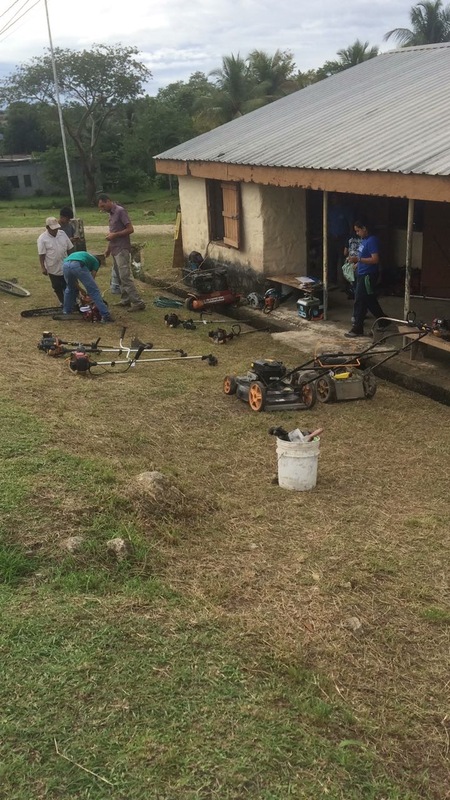 This month’s mission trip amazed me with our busiest mechanic’s clinic ever. During the last two days of our week in San Pedro Colombia, as many as ten of us worked simultaneously on different machines. We saw nearly 100 items in three and a half days, including bicycles, blenders, drills, skill saws, weed eaters, chainsaws, lawn mowers, and a generator. One student who formerly worked in the computer industry even fixed a couple laptops! Unlike our experience here a year ago, almost immediately after setting up shop, broken equipment began to flood in from every direction. Many villagers brought three and even four items each, sometimes making multiple trips over steep hilly roads pushing wheelbarrows or riding bicycles laden with their ailing equipment. I half-jokingly commented that there were likely more broken machines in the village than people! I only hope that they will soon seek our Master Soul Mechanic for themselves with the same intensity and dedication that they sought us on behalf of their tools! “How long are you all staying?” One villager asked. “Like how much longer?” I asked, out of curiosity. I’m sure a year would go by quick and at the same time feel like three and a half centuries. Some fixes were simple. 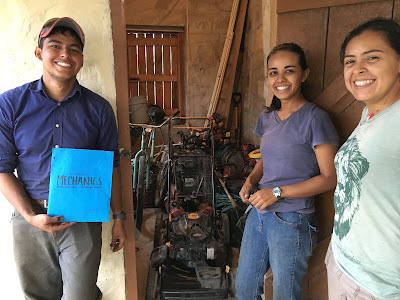 Yessi discovered that the liquid in the tank of one broken-down weedeater was kerosene, not gasoline. She purged the tank, added the correct fuel, and soon had the machine purring “like a brand-new used one.” Other machines were more difficult. I found myself working on an old skill saw that defied my best efforts, and chewed up inordinate amounts of time with no apparent progress. How does God put up with us?The thought suddenly flashed into my mind just as I was ready to condemn both the tool and myself as unworthy of the mechanical realm. It’s incredible! Unlike me with this saw, God knows exactly why we are broken and He knows just what to do to fix us. If He is stymied, it is by our proud, uncooperative, stubborn, unbelieving hearts! That’s got to be frustrating! How does He keep working with us when we seem like an inordinate waste of time? A fresh glimpse of Calvary grasped my imagination. But of course! Considering the exorbitant price He already paid, how could He give up on us now and let His blood be spent for naught? No wonder He continues to tinker: a touch here, an adjustment there, as He prays for a response, for some token of spiritual life in our zombie-like souls! The thought gave me courage to keep working. Eventually, however, I had to lay that saw aside and go on to the next item. We were on a timeframe, and the waitlist of sick equipment was getting longer by the minute. Unfortunately, my next assignment, a Homelite weed eater, wasn’t any easier. What is wrong with this thing?Imuttered and fumed like a sick engine myself. Well, one of us has to do it!I justified myself. Three score and seven pulls later, mine is the only murmur!Why won’t this thing run? Have you ever found yourself asking that question in your spiritual life? In small motor mechanics, there are three basic systems to check: spark, fuel and compression. Similarly, all spiritual malfunctions fall under three basic categories: the lust of the flesh, the lust of the eyes, and the pride of life. Sounds simple right? The problem is, those three categories include a heap of specifics. To complicate matters, in long-neglected machines there are often multiple faults in multiple areas. More often than not, one failure has led to another. The mud dauber nest and cockroach hotel we uncovered in a couple machines, though problematic, were likely not the original causes of engine failure if you know what I mean. With so many things gone wrong, diagnosis can get overwhelming, let alone repair! Now doesn’t that sound familiar? The good news is, there are manuals and experts to help in time of need. I remember one chainsaw that came back to life after we applied our discovery from the manual that the setting for its fuel/air mixture-adjustment needle was a turn and a half more than the standard setting on most brands! What’s the air-fuel mixture in your soul today? Have you read far and deep enough in God’s Word to discover your needed adjustments? Interestingly, as in the soul, finding the cause of decease is more frustrating the more perfect the machine appears! We received one bright-red Shindaiwa chainsaw in pristine condition. Next to the surrounding hunks of junk, it glowed like the inside of a shopping mall at Christmastime. Jonathan’s initial inspection revealed that the issue resided in the spark and ignition system, but the sparkplug, wire and coil were as pretty as the rest of the machine and all tested good. So Jonathan called on Jeff, our resident expert, who got the machine to start, though it coughed, sputtered and popped like a medley of fireless noise crackers before sundown on the fourth of July. In the end, changing the sparkplug fixed the problem. How many parts of your life test out good according to your auto evaluation? You should ask the Master Mechanic. You may be in for a surprise! Praise God, there are remedies that heal even the uttermost brokenness. The man who lived across the street from us told me he heard two guys walking by his house bubbling with praises about how they had received their tools back from the dead. One resident admitted to us that his machine had been parked for three years! Others, like the owner of one weed eater I worked on, claimed he had used the machine just a few weeks previous! Notwithstanding, I had to use penetrating oil to free the rust-frozen spring tabs on the pull start so they could once again engage with the flywheel. Thank God for the oil. Oh, and there is one more mechanical sin that is a real killer: timing. Mechanical arrhythmias. I have learned that many times a lawn mower won’t start because when the blade hit a rock or a tree root and bent or broke the aluminum keyway on the driveshaft, the magneto no longer lines up correctly with the magnets on the flywheel, and so the spark comes at the wrong time. Sometimes its bad enough that the machine won’t even start. Just how important is timing anyway? It’s a good idea to check your spiritual timing. Are you observing time the way God designed? 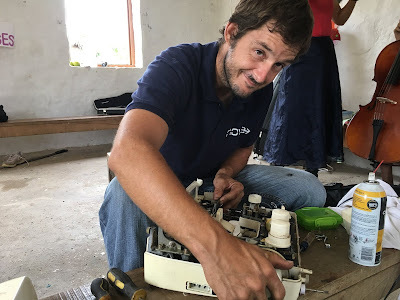 Clint joyfully repairs a sewing machine. Mechanics getting ready to open shop. Machines in the background left from the previous day. Tool inventory on the last day of mechanics clinic. We are in the last week of the three-month phase of the MOVE program. The missions fair, health class outreach, survival camp weekend, student presentations, week-of-prayer, and education outreach and student-led mission trip are all in the books, and it is time for the final evaluations. The number ten in scripture is associated with law and judgment, so it is ironic that this class, although they also have many good qualities, have been probably the most lackadaisical and relaxed group I have seen here so far. Generation laX may be a more fitting moniker for them. It has cost many of them some hard knocks to begin to see their deficiencies. In many ways they remind me of myself and my own mediocre, Laodicean condition! Lately I have been studying the pre-advent investigative judgment. What a solemn reality it is, especially in the context of current developments in the world church and the world at large! What a deep need is mine to scrutinize my life and leave no stone unturned, to die to self and put things right with God. These are golden moments to seek the Lord with a whole heart, and to invest everything in developing the image of Christ in the soul. Like a polaroid, it might take some vigorous shaking. We have way too much to unlearn, and so much more to learn, and so little time. Interestingly, time is profoundly connected to judgment in the Bible (Ecl 3:17, 8:5, Acts 17:31, 1 Peter 4:17, Rev 14:7). The Sabbath, as we know, is the only commandment that signals time. It is also the day that Jesus spent in the tomb when He bore the penalty of God’s judgment against sin. Thus the Sabbath serves to remind us of our need to die to self and sin, while it simultaneously illustrates the reality of both liberation and restoration, the essential experience that we need in this judgment hour (see Rom 6:5-8, Gal 2:20, Deut 5:12-15, Ex 31:13, Eze 20:12). But the Sabbath is even more than this: it will eventually become the visible litmus test, the great line that will divide between those who choose to worship the Creator God and receive His seal, and those who choose to worship the Beast and his image and receive the mark of his authority. May we be ready, and may we be faithful! P.S. During the Thanksgiving supper last Friday night, the students presented us with a wooden tablet they had carved the letters Gen. X along with all their names. The abbreviation made me think of Genesis chapter ten, the table of the nations, which I found very fitting, not only because this group of students represents six different countries, but also because it prefigures the work they will do among many nations, by the grace of God. Below is the list of their commissions for the next six months to a year in eight different projects across five different countries. 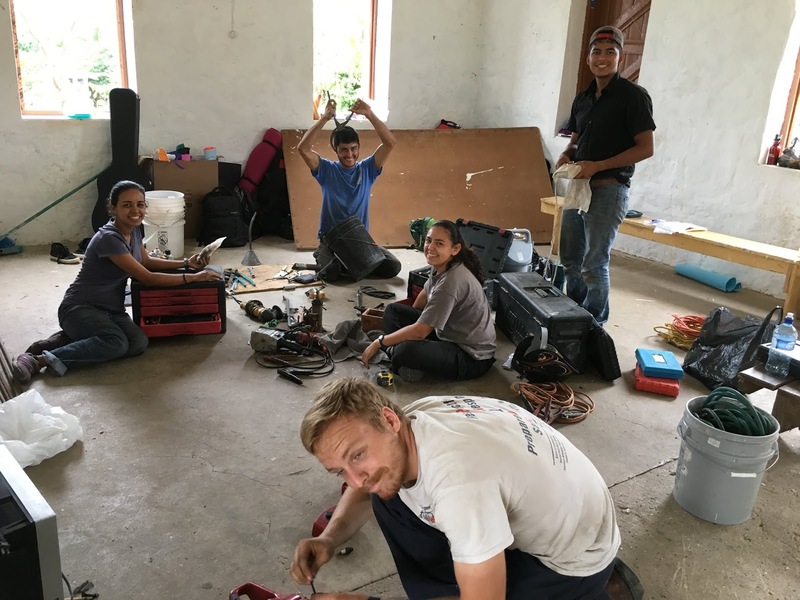 n John, Gerson and German: Reach International orphanage and school, Honduras, C.A. n Anthony, Damaris and Abi: Bolivia Industrial School in northeastern Bolivia. Benjamin: Maintenance Project, doing vehicle and equipment maintenance at mission projects across Bolivia. Pack thirteen items or less. Follow a map to your campsite. If you want filtered water, make your own charcoal filter! These are the basic rules for the traditional Practical Skills Class survival camp here at MOVE. For every missing homework assignment in class, each student will be missing one of their thirteen allowed items. Some of the less-than industrious have had to scrape by with only six of seven! There is no time to lose. God has precious, though difficult, lessons of faith for us to learn today that will prepare us for what is coming. But we must be willing to endure hardness as good soldiers. Lord, may we accept with gratitude today’s trials, knowing that in Your mercy and wisdom you are preparing us to survive tomorrow’s crises. Help us to trust You more and not shirk from our duty no matter how difficult! Before leaving the bush on Sunday morning, the students must complete a series of exercises as a team. Several of them are designated as blind, mute and lame, just to make things more interesting. My job this time was to scout a location on the creek and explain and supervise the students’ river-crossing challenge in which they must get the whole team across without touching the water. I walked some old tire tracks until I came to the creek, and then followed it upstream, looking for wide spots that would make for a more interesting crossing. Suddenly, the jungle in front of me erupted with beating wings as half-a-dozen vultures took flight. I consoled myself that they were probably as startled as I was. A brief search for the corpse yielded no results, so I continued a little further up the creek until I found the perfect crossing place at a wide bend in the stream. As I crouched on the uprooted end of a fallen log, waiting for the students to arrive, I heard the distant baying of hounds. Someone is out hunting today in our neck of the woods.Not good! I thought of all the stories I’d heard of people shot by hunters whose emotions exceeded their vision. At least the students are all together, and their last activity was the obstacle course right on the power line access road, so they should be pretty safe. Several minutes passed. The baying intensified, and seemed to be coming in my direction. Could the dogs be tracking me? Will they know the difference between my smell and the smell of a forest critter? I probably smell like an animal, since I haven’t had a bath since the day before yesterday! The barking was getting very close now, and then I heard the singing blade of a machete slashing through the brush. I’m not even wearing hunter’s orange! I could be in real danger! One of the hounds appeared abruptly, loping along quickly, nose to the ground. He passed me by and paid me no mind, but the hunter would surely be along at any moment, and I didn't’ want to be mistaken for anything not human! Should I make noise? Hide? Run? No, definitely not run! And then, there he was, the man with the machete. “Shaw! I’m sure glad it’s you!” I called out in relief as I recognized the "hunter" was one of the other staff members. “The dog came by and I thought he might lead me to you.” Shaw laughed. I was happy to hear it. The students soon arrived and completed their activity and we hiked back to campus without incident. Can you imagine what it will feel like to be a fugitive, hunted by dogs and armed men? Such a day could arrive sooner than you think. But even today we live in the hunter’s zone. The great hunter, the same Spirit that inspired Nimrod, is out to bag your soul. Don’t you go anywhere without Christ, you hear? Promise me that! P.S. I want to thank all of you who have remembered Luciano and his family in your prayers. 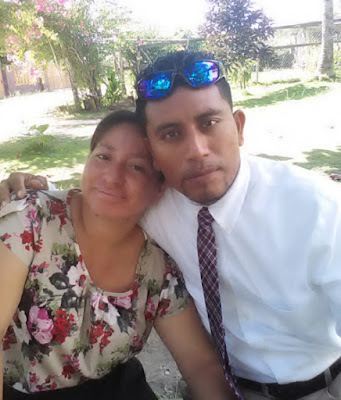 Luciano attended the evangelistic meetings the week before last, although he is still not coming to church regularly. It's good to see him smiling again. He says the Lord has answered our prayers and he landed a job with the sugar company. He doesn’t start for another couple weeks though. Please help me pray that if there are Sabbath conflicts he will be faithful. I have already encouraged him in this direction, but I know the fear of being without work again will be a strong temptation for him to compromise. P.P.S. To all of you who have been affected by the devastating Camp Fire or other fires in California, we are praying for you earnestly, not only that God will supply your every need and sustain you in this trial, but also that you will come through it as finer gold, closer to God, and stronger to face whatever may be next. Our heart goes out to each one of you! I teach ESL and Lyli teaches the Education Elective for the three month training course.